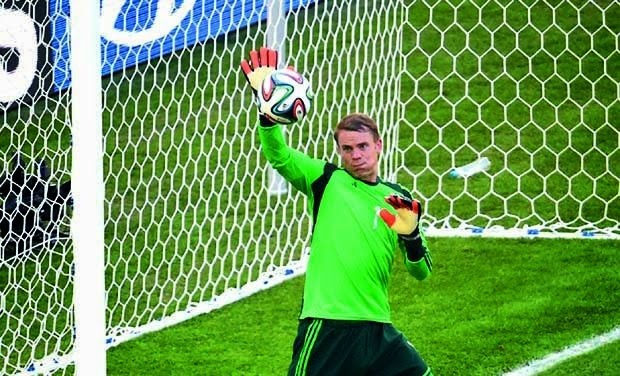 At the end of the World Cup final on Sunday, Manuel Neuer cemented his place as the greatest goalkeeper in the world. Over the last month he displayed how he has earned that label and his exemplary play earned him the coveted Golden Glove as the tournament's best keeper. Neuer tracked down virtually every ball played within his end. He set a record for most touches in a match outside the penalty area by a keeper with 21 against Algeria. He even boasted a higher passing completion percentage than Lionel Messi. Manuel Neuer was the keystone of success for Germany, just as he has been for Bayern Munich for some time now. His considerable skill, dribbling ability, and distribution allow Germany's full backs to press higher up the pitch, creating more pressure on the opposition. This allowed Germany to attack with eight, while the center backs could play wider and Neuer scooped up any loose balls in the middle. This tactical advantage allowed Germany to attack with lethal force against Brazil, while remaining stable at the back against Algeria and Argentina. His heat maps for the World Cup cover almost an entire third of the field, something no other keeper at the tournament could boast. Manuel Neuer possesses the skills set to be an outfield player, yet his body dimensions, jumping ability, and reflexes make him a perfect goalkeeper. Standing at 6'4'', 200lbs, he has a body similar to Jon "Bones" Jones or Richard Sherman. He is a super-athlete wearing a goalkeeper's kit. With almost every performance he spectacularly refutes Twitter critics who clamor for him to stay within the penalty area. He is calm under pressure, capable of making the big saves, as he displayed in the dying moments against France when he denied Karim Benzema with a palm of defiance. As time goes on, and the tactical advantage that Germany and Bayern enjoy grows more apparent, we will begin to see the sweeper keeper role utilized more commonly. Children will grow up wanting to become goalkeepers, so they can dance around defenses and deny attackers in the same fashion as Neuer. Players will want to emulate him because he is involved in buildup for attacking play. Few things in football are more impressive than Neuer starting a counter attack. He is the model goalkeeper for the future and possibly one of the best of all time. He is a treasure for our time. If any one say, who is the best goalkeeper I ever seen. I will answered "Manuel Neuer". I don't know other's opinion but he is a great goalkeeper and a legend to follow for me. I don't a match of Germany only for his performance.